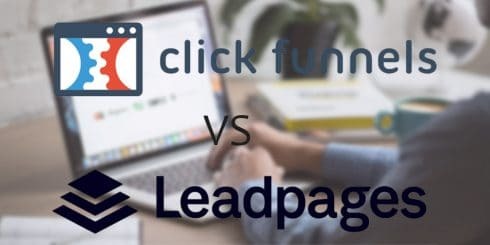 Home /Clickfunnels vs Leadpages – Which One Will Convert Your Visitors Into Customers the Best? Any online business will need more than a simple landing page to generate profit. E-commerce is no different. To turn leads into customers of your online store, you must develop a sales funnel. This process brings your target audience closer to making a transaction with your site. Creating a sales funnel from the ground up is no easy task. However, it’s a good thing you don’t have to do this on your own. There are some tools dedicated to helping business owners create a high-converting marketing sales funnel for your business. Two of the best ones out there are ClickFunnels and Leadpages. But which between the two is right for you? In this ClickFunnels vs. Leadpages review, we’ll take an in-depth look at both products. By the end of this post, you’ll see the difference between the two. We’ll also provide you with some ideas on how you can use them to your success. Leadpages is a cloud-based landing page software. Their pages are mobile-responsive and can be built through their drag-and-drop editor. This makes the product appealing for people with limited to no coding experience. You can monitor the performance of your pages from within the site. ClickFunnels can do the same things as Leadpages. What sets it apart is its sales funnel integration. This basically allows you to not only create landing pages but also add a shopping cart or one-click upsells. You can even set up webinars if that’s your thing. Before we move on, it’s important to discuss just what a landing page is exactly and why we need them. Unlike a website, a landing page is a standalone page. Their specific purpose is to hold ads for businesses. They’re often used in conjunction with a PPC campaign as you do in Google AdWords. Landing pages are designed to get users to take on a specific action. What action they’re supposed to make is often indicated in what’s called a CTA (call to action) button. And when users follow through, that’s when you make a conversion which is industry-speak for a successful transaction. You’d think that CTAs are all about getting a sale. And in most cases, that is true. However, some entrepreneurs define conversion rate differently. Their goal could be acquiring e-mail lists. They may also want to use a landing page for webinar registration. Sure, you can use your website or company blog to promote your business. But having a dedicated landing page with singular focus makes it more efficient and targeted. Leadpages is a software that helps you create landing pages for your business. You can use Leadpages even if you don’t know how to code. This eliminates the need to hire a web designer. It gives you complete control over the design of your landing page. Signing up for the service gives you access to over 100 templates. Their Leadpages Editor, a drag-and-drop editor, makes designing fast and easy. Building a landing page could be done in minutes once you get a hang of the interface. Of course, there are other built-in features that make Leadpages crucial for marketing campaigns. You get the ability to conduct A/B testing (also known as split testing). The feature lets you compare two landing pages against one another to see which performs better. Leadboxes are pop-up boxes you can trigger at a given time. If your user decides to leave your page, a Leadbox gives you one last chance to persuade and convert. Using any or all of Leadpages’ features can put your business past your competition through the power of their landing page software. Try Leadpages for FREE Right Here! You can choose from three Leadpages plans upon signup: the Leadpages Standard ($25/month), Leadpages Pro ($48/month), and Leadpages Advanced ($199/month) plans — all billed annually. You can opt for their monthly billing plans but they will end up costing more over time. The features you unlock will depend on what plan you subscribe for. All plans let you create landing pages and include access to their templates. You also get to use their pop-up forms, double opt-in, exit intent, and timed display triggers. Your subscription includes free hosting in their secure subdomain. Only the Pro and Advanced plans have the 1-click signup links (Leadlinks) and SMS campaign (Leaddigits) features enabled. 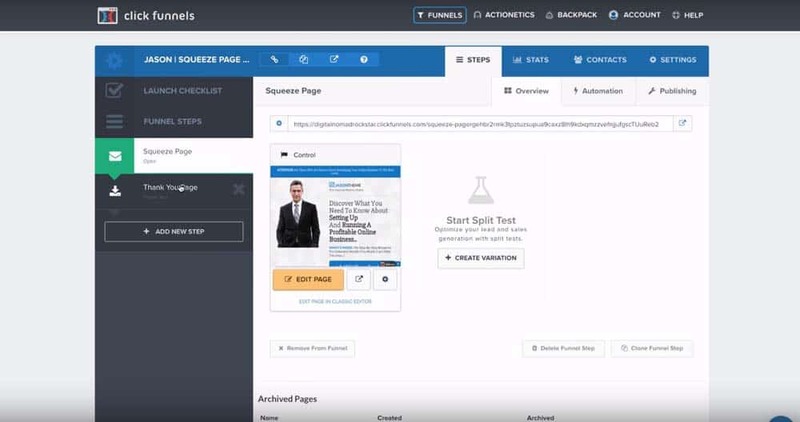 Leadpages also has marketing automation features with HubSpot, Marketo, and OntraPort. Signing up is easy. The site offers a free trial but you are required to provide credit card information. You can start creating landing pages the moment you’re in. Start by browsing through the company’s long list of template options. There are two types to choose from. They have standard templates and drag and drop templates. The standard templates appear dated and clunky because these were originally offered a few years back. They have recently shifted their focus on the newer drag and drop templates. And they encourage users to use these instead of their standard offerings. Once you’ve selected a template, you will enter the Leadpages Editor where you can edit the sample text and add new images. The drag-and-drop functionality is simple to use but it’s important to know that the editor does not support free-form editing. Users can’t just place text and anywhere on the page. This means design elements have to “snap” into place. You can switch between several viewing modes: responsive, tablet, and phone. This way you can check how your landing page would appear across all devices. You can set up split testing and other options you’re while logged in. You have to connect your account to your email service provider. Users would be unable to publish their landing pages and save any collected email list until this is done. To help you understand how many visitors your landing page is attracting, you can integrate Leadpages with Google Analytics to help you unearth vital information about your page. Use the data to create a better performing landing page to increase your conversion rate. With Leadpages, you’re able to launch landing pages minus all the usual hassles of web design. Do you need a simple landing page or do you need sales pages? Landing pages and sales pages are two different things. You have to determine which one of these you need based on your goal. So what are sales pages? Like landing pages, sales pages are specifically built to convert users. The main difference is that they’re centered around making a sale. Sales pages also tend to be longer and have more navigation options. Sales pages are suitable for promoting a product that requires an in-depth explanation. Sales pages are well-rounded in a sense. They guide users from raising awareness all the way to purchase — otherwise known as a sales funnel. That’s why sales pages today have additional features that go beyond opt-in messages and countdown timers. They now have payment capabilities that makes purchasing much more efficient. ClickFunnels can help you produce sales pages and convert users into paying customers. 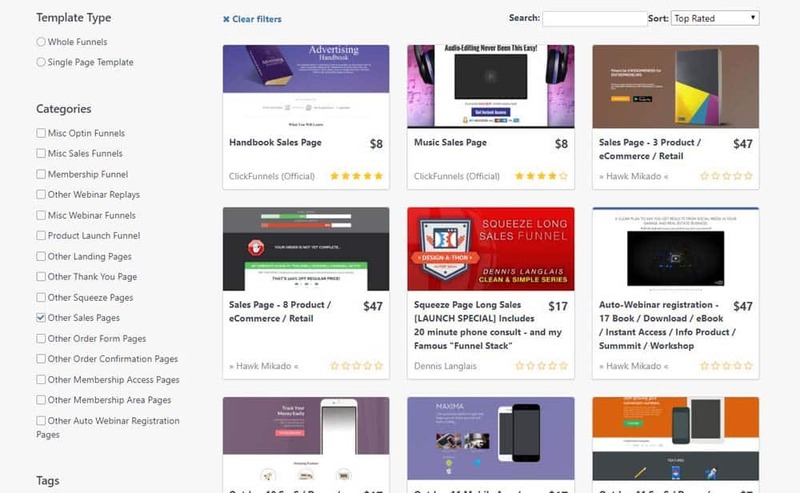 ClickFunnels is an easy-to-use online platform for building sales pages. It runs similar to Leadpages. But it has features that make it ideal for making sales, generating leads, or running an event. At $97/month for their basic plan, ClickFunnels is on the expensive side. But to some entrepreneurs, the included features could justify the cost. Unlike Leadpages, ClickFunnels builds a series of pages depending on what you’re trying to achieve. This collection of pages are what they refer to as funnels. There are three basic types of funnels: Leads, Sales, and Events. Each type of funnel has sub-funnels that let you cater your sales pages to your goal. If your intent is to generate sales, for example, then you can select a two-step funnel or a video sales letter funnel. You can also go the product launch funnel route where users gain access to video how-tos or demos. This will help them understand the product better before committing to the purchase. There are more types of funnels to choose from once you’re in the site. All you need is to set your goals and find the appropriate funnel for your campaign. Once you’ve signed up for the service, you’ll eventually land on the dashboard. Here you can access all your options. Start a new funnel by hitting New in the dashboard. You’ll then be greeted by several funnel options. You can filter funnels by ticking selections in the sidebar. Select a funnel to continue. After selecting a funnel, you’ll be directed to another page. This new page will contain a brief explainer video and text to help you understand what the funnel can do for you. Scroll down and you find a bunch of templates for your funnel. Click Get Funnel to download the theme and create your funnel. Try Clickfunnels for 14 Days Right Here! How much does a marketing funnel cost? Some templates are free. However, there are templates that you need to pay for. These paid templates are premium designs made by other users. Prices vary depending on prices set by the designer. Some funnels you can buy for $47 while others can cost as much as $297 per set. Some funnel templates can even be bought for as low as $8. If you can’t find a suitable template, you can ask of the ClickFunnels’ certified designers to build a funnel template for you. Like other users, you too can sell in ClickFunnels’ marketplace. Remember that the cost of each marketing funnel is added on top of your subscription. As you create your sales pages, you’ll slowly be introduced to a few things that make ClickFunnels special. You get to create an identical funnel give or take a few changes. The idea is to test which pages users would respond to best. You can use different images or call-to-action. Having this kind of data will help you understand your users’ behavior better. Use this data to create more appealing funnels in the future. Want to See My Advanced Keyword Research Strategies that Even a Beginner Can Learn? Read my comprehensive guide on stealing keywords for competitors. I use this tool to cherry pick the keywords that I know I can rank for quickly…even if my site is newer. Similar to Leadpages, you can use Google Analytics for Click Funnels to help make sense of your funnel’s performance. 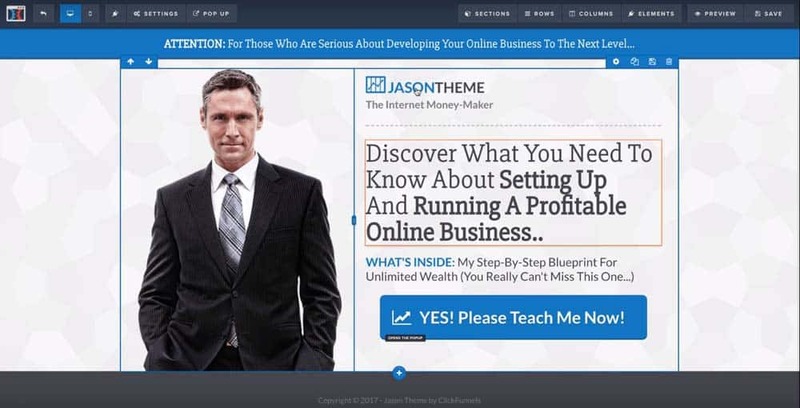 The ClickFunnels Builder itself is pretty easy to use. Simply hover over an element and click if you want to edit the text. You can bold, italicize, and underline copy as you would in MS Word. Adding hyperlinks can be done with a click of a button. Click on images if you want to replace it with one of your own. No need for coding. Its drag and drop feature is comparable to Leadpages. When you click a CTA, a menu will pop up. This gives you control over what happens when users click the button. Users can go to your website or be redirected to the next step in the funnel. You have to integrate ClickFunnels with your email provider before launch. Customizing your sales page is made easy because of the ClickFunnels Builder. The Backpack feature comes with the advanced plan ($297/month). It gives you the ability to create an affiliate program. So if your product is doing well, your customers can sell on your behalf in exchange for a commission. Backpack will generate the unique affiliate link for your customers. There are several payment gateways you can set up to may transactions smoother. You can use Stripe, BrainTree, Infusionsoft, JVZoo, ClickBank, Taxamo, and Ontraport. You will need to set up your payment gateway before launch if your sales pages are transactional in nature. You will also need this if you’ve enabled affiliates. ClickFunnels support 3rd party processors to help you track purchases. These include PayPal, JVZoo, ClickBank, and Warrior Plus. ClickFunnels makes videos and other training materials you might need to get up and running. These tutorials are informative and well paced. It tells you everything you need to know right away. All the efforts they’ve made to make the onboarding process a delight is hard to ignore. There is an online chat feature for those who need real-time assistance. Selecting a funnel is a cakewalk. ClickFunnels does a wonderful job laying out all your options and filtering them out. It’s easy to find templates that are geared toward your audience. New users would have little trouble setting up their account for the first time. It’s such a time-saver. You’ll be sending out your sales pages in no time. You can activate ClickPop to enable pop up messages in your sales pages. Use this to say a quick thanks or entice customers with another great offer. It’s yet another way of connecting with your audience. There’s not much difference between ClickFunnels and Leadpages. At least on the surface. Both products provide their users a way to create landing pages for their businesses. They also have drag-and-drop functionality that lets users create pages without the need for coding. Leadpages and ClickFunnels have seamless integration with different email providers and include hosting in their plans. Both sites feature lots of mobile-responsive templates in their collection. You can conduct split testing on both platforms. Both can be used to promote webinars and two-step opt-ins. However, ClickFunnels excels is in its ability to create full funnels. The fact that you can insert a shopping cart is a game changer. This with the ability to integrate with payment processors makes life so much easier for entrepreneurs and marketers. It really helps with lead magnet campaigns. Users are also able to do smart email sequencing, tracking per page conversions, and change the funnel order on the fly. With ClickFunnels, you get the complete package. Where this all boils down to is the pricing. There’s no denying that ClickFunnels is the more premium product of the two. At $97 a month, some users might have second thoughts. But if the features mentioned can help propel your business forward, maybe it’s worth considering. You have to remember, you’re eliminating the cost of hiring a designer. Plus you’re saving time since you can create a campaign on your own pace. Creating a sales page takes minutes once you’re used to the process. And if all you need is a simple landing page then you should definitely go with Leadpages. It’s cheaper than ClickFunnels and you get plenty of landing page templates along with your plan. Their new mobile-responsive templates look sleek and modern which is not always the case with ClickFunnels. Leadpages is designed to do one thing: create landing pages for lead generation. And Leadpages does that very well. So if that’s all your business requires then you’d be very happy with them. But if you need something more powerful, Click Funnels is the way to go. All the features included with their plan might be the only tools you’ll need to drive your business. It really is made for online marketers. ClickFunnels is a godsend for businesses with plenty of products to offer. They can run a sales funnel for each one. The way it integrates videos into their funnels can be used to educate your customers. Plus the affiliate feature gives you an opportunity to generate more sales. ClickFunnels, given all its features, is the better landing page builder compared to Leadpages. It has a better chance of generating a lead magnet or two.